Many of you have requested a more in depth tutorial on the crib headboard and how I attached it, so I'm just going to expand a little bit on the previous post that I did. Hopefully this will clarify a few things but if you have any additional questions ask away! We were very fortunate to receive a crib from a very sweet couple. It was in excellent condition and is a beautiful, solid piece of furniture. Naturally since it was in such great shape I didn't really want to paint it or mess up the finish so I decided to add my own little touch to it to personalize it. I stored this idea away long before I was pregnant because I thought it was so clever. 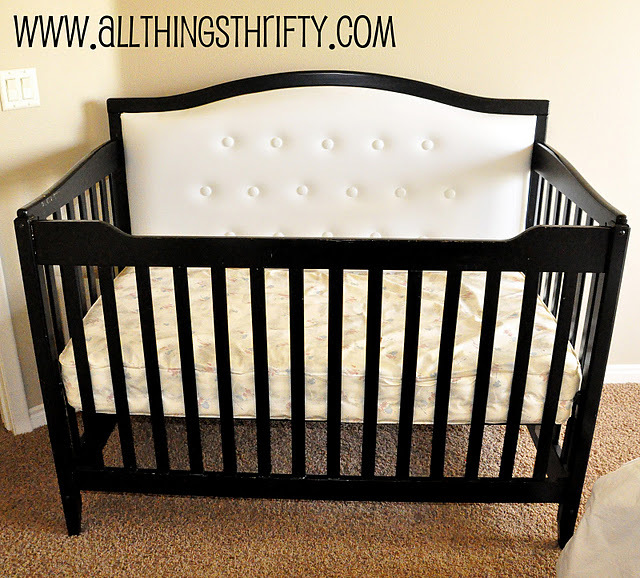 The oh so creative girls at All Things Thrifty did something similar to a crib that got my wheels turning. Check out their version and more details here. I love what they did with theirs but was a little nervous about the buttons and wanted a more feminine look. So, I started out with a piece of board from Lowe's. It's basically the peg board you use in the garage with the holes in it minus the holes. It was the perfect weight and I knew it wouldn't bend or warp like plywood can do sometimes. I wanted the top to have a curved edge so I made a template using craft paper. Next, I taped it onto the board and traced the template. 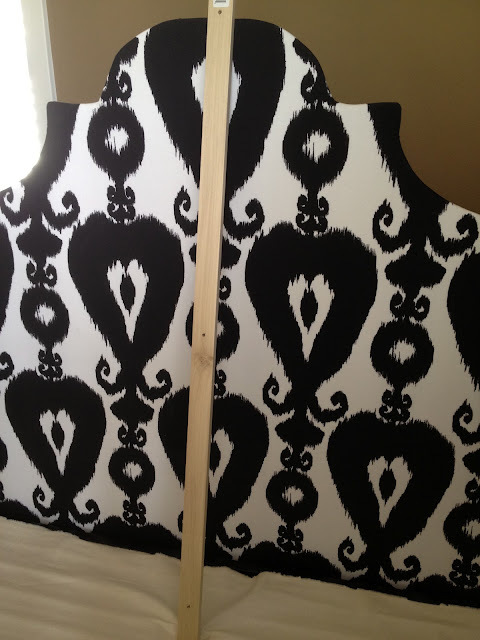 Then, I cut the shape I wanted using a jigsaw and following the line I had traced. Next, I covered it with white fleece material. I thought about doing a thin layer of foam but didn't want it to be too thick to where it wouldn't fit in the crib easily. The fleece was just thick enough and cheaper than the foam too. Then I covered it with material and attached it to the crib. I didn't want to damage the crib so I had to get a little creative with how I attached it. Basically I purchased two inexpensive pieces of 1 x 2 from Lowe's and had them cut it a few inches shorter than the width of my headboard. 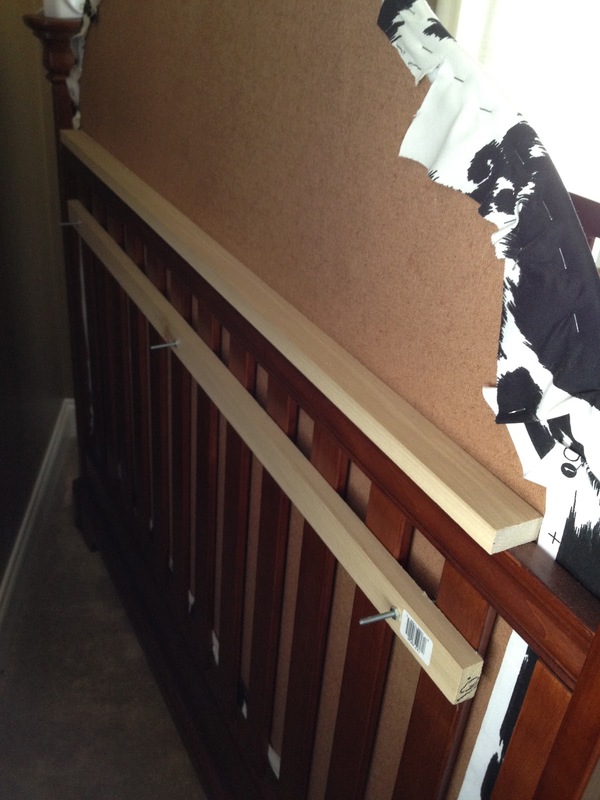 Then (I didn't take a picture of this) but I attached one of the pieces of 1x2 (horizontally) to the back of the headboard where I wanted it to rest on the railing of the crib. I attached this piece before I attached the fabric because I screwed my screws through the front of the board into the 1x2 on the back. That way the screws were covered by the fabric. (If you weren't concerned about keeping the crib undamaged, you could just screw the piece of 1 x 2 directly into the crib railing after you attached it to the board, but I didn't want to damage the crib.) I also screwed three long screws through the front in a horizontal row, about 6 inches below where I screwed into the 1 x 2 (measuring where they needed to go before hand so they would come through the rails on the crib) Hopefully this picture will help it make a little more sense. I added some nuts to the bolts and screwed them on tightly to make sure the bolts would stay in place. You can kind of see them in the picture above. Then, I took my second piece of 1 x 2 and drilled three holes in it for the screws to go through. This piece of wood is going to go the opposite way of the first piece (you'll see in the picture). I measured where they needed to be to make sure they would be in the right place. Then, I attached the 1 x 2 to the back of the crib making sure the three screws fit through the holes I drilled. Finally, I tightly screwed on three nuts to make sure it would stay in place. 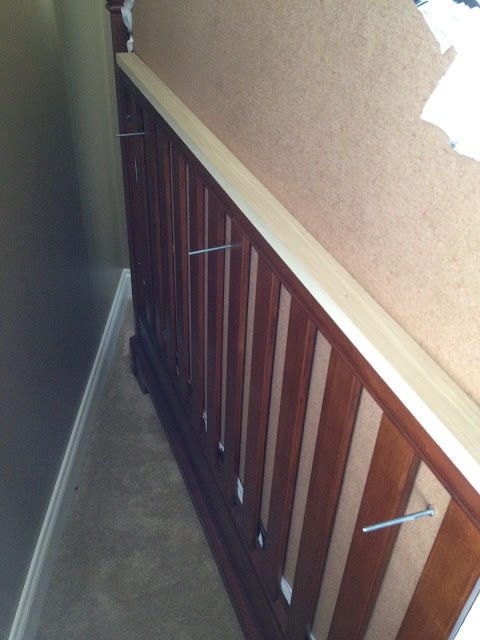 This method worked really well for us and did not damage the crib at all which was our main concern. Now, if I decide to do something different with it down the road there is no damage done. Wow, you always pack a punch with your projects! Great job and so fun! This is so beautiful. I love that ceiling, too!!! What a STUNNING nursery! I definitely had to pin this to "For the home" board for inspiration. You did a great job. I love the ceiling and the headboard. hi! looks great! how did you cut the "peg" board? What a fabulous idea. Your choice of fabric really enhances the entire room. I love it! I just love this. I'm definitely doing this with my 6 month old baby's crib. Your projects always have so much class! So pretty!! Getting very excited for you . this room is so so so chic and adorable! 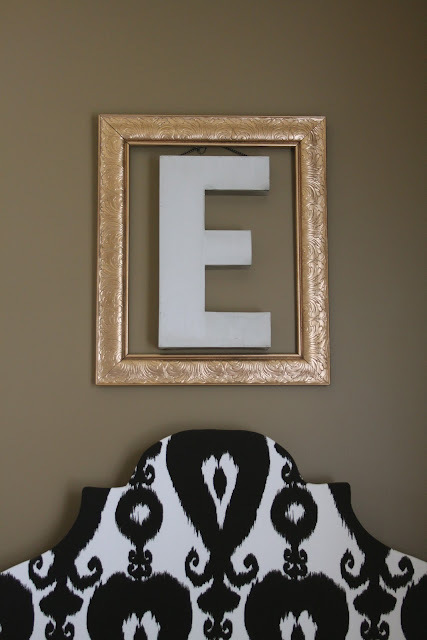 i love everything about it...especially that cute little sequin pillow i spy! What a great idea! Maybe that would easily transition into a headboard when you are finished with the crib. Beautiful...and I love the fabric too! What a fabulous idea! And that fabric - to die for! So beautiful. What a "Loverly" room. What a great idea. Way to customize a crib!!! So impressed. WHERE did you get the floor pouf?! or HOW did you make it?!!?! :D gorg room! 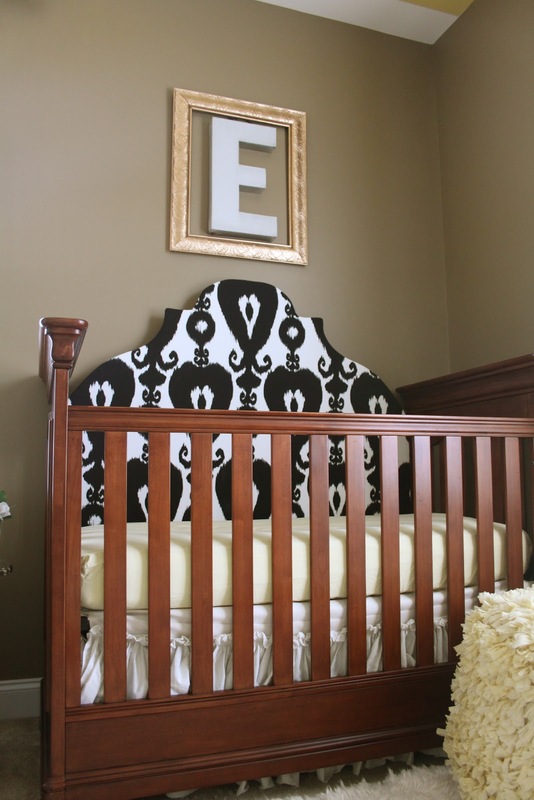 Gorgeous nursery, it should be in a magazine, you did a wonderful job on the crib! Can I ask about the light. 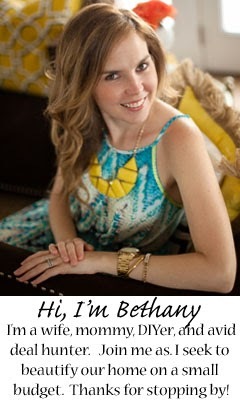 I just found your blog and have spent way too much time here. Loveley. Will be visiting often and spreading the word. Anyway, did you make the light fixture? Love it. This is so beautiful. I love that ceiling. I love the nursery ceiling and color scheme. What color did you use on the walls in the nursery? I would love to know. Thanks for the info! I'd also like to know what colors are on the walls/ceiling. If you could let us know, that would be great. Thanks! please post pics of how you attached the headboard. i love this idea and would like to use it for my nursery. I was wondering... how many yards of fabric did it take? Thank you so much for posting this! I can't wait to get started on my little girl's room.